Using the Composer you can combine different video clips that you have made using the app. Open the script editor in your web desk in order to have access to the video takes, choose the take that you want and click on the 3 dots. Select "Add to shared bin". 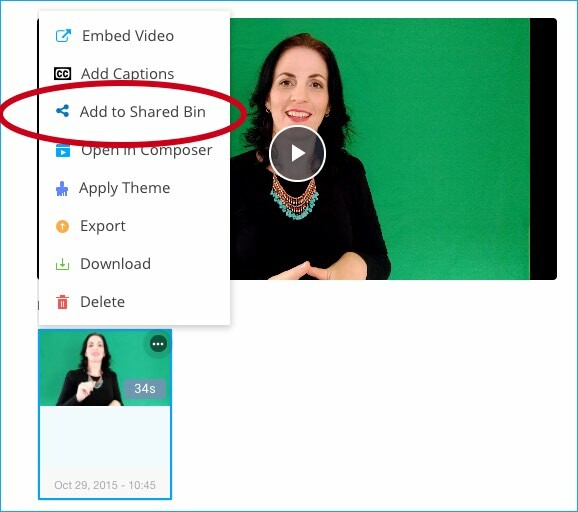 Now your video will be uploaded to your shared bin which can be accessed in the right panel. Do this to all of the videos that you want to combine together. Go back to your desk and click on "Create Video"
Drag and drop them into the storyboard as segment, when you have added all of the videos you can add transitions, captions, your logo and more. When you are finished click on and "Save and make a new video"